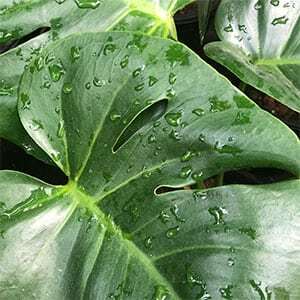 With large glossy leaves complete with holes, and commonly called the Swiss Cheese Plant, Monstera deliciosa is widely grown as an indoor foliage plant. It has been grown for many years and is still a favourite for the large textured foliage and easy care nature. It is the holes in the leaves, (fenestration) that appear in good growing conditions as the leaves mature that give the plant its common name. In warmer climates, you can also grow outdoors in a sheltered position. Monstera deliciosa tauerii is a smaller growing form. Monstera obliqua – narrower foliage and more of a climbing variety – rare in cultivation, very thin leaves with most of the leaf (70 – 90%) being holes..
Monstera adansonii – More holes than M. delicosa and less than M.obliqua.. Eventually you will need to provide this large growing with support as it is naturally a climbing plant. If you don’t, it will simply grow across the floor. So allow for this when choosing a container and placing you plant in position. You will need very good filtered light to grow this plant well. It will not stand direct sun, this will quickly cause leaf burn. If light is not adequate the foliage tends to be smaller, the holes in the leaves also smaller or even non existent, and the leaves to be paler. Although this is a plant that likes moisture, it does not like wet soggy soil. Water deeply, allowing excess water to drain away. Do not water again until the soil begins to dry. Simply stick your finger down into the growing medium, if its moist, do not water, if it is dry, water. Deep watering is best, so do this outdoors or in a laundry. Water well, and then let the plant sit for a few hours to allow the excess water to drain away. When you water, check that the drainage hols in the potter clear. The time to fertilise is when the plant is in active growth, this means spring through summer. An application of a liquid fertiliser every 4 weeks over this period will be adequate. You will need repot every 3 – 4 years, any general purpose potting mix will do. Again do this in spring. This is an easy plant to grow from cuttings. Stem cuttings can be struck in soil, or even in water. Position – Good filtered light.. Soil – Moist free draining. Flowers – White spathe like followed by a fruit.